We would love to welcome you and your family to enjoy a share in our harvest season, which runs for 22 weeks, from June through October. Once you join our CSA, you may come to the farm weekly to fill your Natural Roots tote bag with your selection of freshly picked and washed vegetables. We also offer Part-Time Shares, by which folks can come any 10 weeks out of the season, and Shopper Shares, which are basically a credit toward vegetable purchases, giving the shopper even more flexibility as far as amounts and timing. Distributions are on Tuesdays and Fridays, from 3:00-6:30pm. 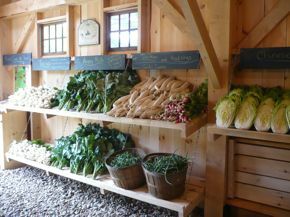 Please see the Main Season page for many more details on what the CSA share options at Natural Roots entail. Now is the time to sign up for your 2019 share! "Your farm is beautiful in every way. From the idyllic setting to the spectacular views; the animals; the gorgeous produce, of course; and most of all, the deep integrity of your intention."